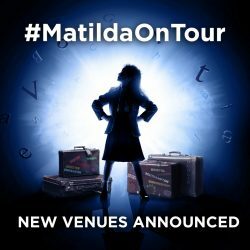 We are delighted to announce that the UK & Ireland tour of Matilda The Musical will extend into 2019 with six new dates added. Following the already announced dates, we will play Plymouth, Bradford, Edinburgh, Bristol, Southampton and Norwich. The full dates will be Theatre Royal Plymouth (15 January – 16 February 2019), the Alhambra Theatre, Bradford (19 February – 23 March 2019), Edinburgh Playhouse (2 – 27 April 2019), the Bristol Hippodrome (7 May – 8 June 2019), Southampton Mayflower (11 June – 6 July 2019) and Norwich Theatre Royal (16 July – 17 August 2019). Tickets for Plymouth, Bradford, Edinburgh, Bristol and Norwich will go on general sale on 23 March following a priority booking period between 19 and 22 March. Tickets for Southampton dates will go on sale on 10 April following a priority booking period between 3 and 9 April. Visit our tour dates page for more details. Casting for these later dates will be announced in due course. Performances will be accompanied by a specially devised education programme, Change My Story, for schools. For further details visit uk.matildathemusical.com/tour/schools/matilda-school-resources/.